IF YOU HAVEN’T ENTERED THE GIVEAWAY FOR TREATS, GO DO THAT NOW!! 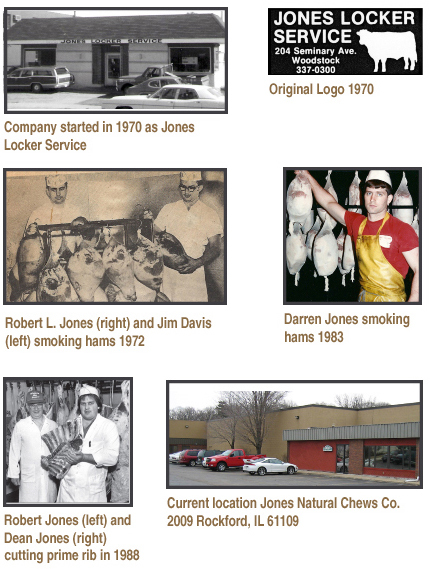 In 1970 Robert L. Jones founded this company (Jones Meat Locker) as a small meat market with a smokehouse to provide custom butchering and smoking for local farmers in Woodstock, IL. The best cuts of meat also produced the best bones and word traveled fast that Jones was the place to go for naturally baked dog chews. By 1988, three of Robert’s children, Darren, Dean and Laura joined the company and were eager to expand the dog chews. Suzanne (Jones) Madenis, Robert’s fourth child, has now joined the company as well. Robert is the dad. He’s good people. He and the mom, Darlene, retired a few years back and let the kids take the reins. I say kids. They’re all old, like me. Heh. Don’t tell them I said that, okay? As long as we’re in the Wayback Machine, y’all, when Laura and I were college roommates in 1985, our parents sent care packages. My mom sent pretty amazing homemade chocolate chips cookies. But Laura’s dad? He sent beef jerky. Dogs would be so jealous if they knew we were getting the REALLY good stuff. OM NOM NOM. I mean, Jones Big Paw Jerky is amazing, and dogs go nuts for that and all of Jones Natural Chews treats, but that jerky back in 1985? Y’all, it was the fatty ends. The parts where all the flavor lived. Seriously. I can’t even begin to tell you how drool-worthy that beef jerky was. Where was I? I think the drool just shorted out a key on my laptop. I wonder if Laura still has connections at the Meat Locker? Do you think she can get me some of those fatty ends? Do you think my hips will mind? *sigh* Probably not a good idea. In more than 25 years since leaving school, Laura and I stayed in touch. I got married. She got married. I had kids, she had a sweet daughter. She would come down to Florida, where we lived for way too long, on vacation and we’d hang out for a day or so. She would talk about the dog treat business. I remember, all those years ago, that being all natural was a really big deal to Jones. Being all made in the USA was also a really big deal. The Jones family all had/has dogs and wanted only the best for their dogs. That’s not all of it – these Jones siblings are all very hard workers and men and women of strong integrity. They really only wanted the best. I don’t think it matters what industry they wound up in – Robert and Darlene raised them to work hard at everything they did and to do their very best to make sure they produced the best product they could. So. All that to say, I’m glad to be working for and with Jones. I’m grateful to be a tiny part of what they do. I guess this isn’t just TBT, or Throw Back Thursday, but also Thankful Thursday. Thanks for letting me travel backward and share. IF YOU HAVEN’T ENTERED THE TREAT GIVEAWAY, IT’S NOT TOO LATE! GO LEAVE A COMMENT NOW!! !